Rush's prog drumming legend Neil Peart tells us about his continuing pursuit of drumming excellence. The Professor lets us in on why after 45 years behind the kit he's still working to make himself a better player. Neil talks about taking lessons, improvisation, finding the perfect sound and much more. 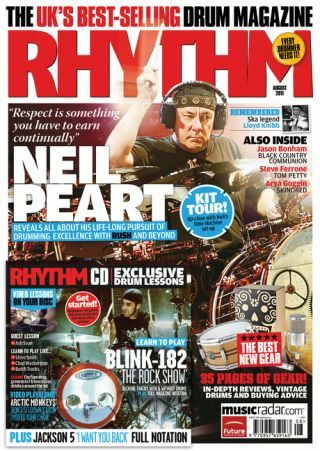 We also get a guided tour of the Time Machine kit from Neil's drum tech Lorne Wheaton and wind the clock back to The Professor's first-ever Rhythm cover. You can pick a copy up from all good newsagents or order online at www.myfavouritemagazines.co.uk now. You can also find digital versions at Apple Newsstand and Zinio.com.